Do you want to learn about the Aggregates, Its Qualities & its types? If yes, then you are at right place. Here in this article, you will learn all about it. 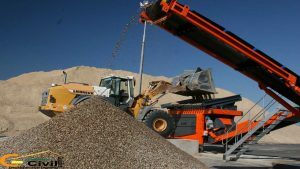 Aggregate Classification | Types of Aggregates. (1.) Aggregate Types on the basis of Grain Size. (2.) Types on the Basis of origin. (3.) Types on the Basis of Density. It is defined as: “Aggregates are the inert materials that are mixed in fixed proportions with a Binding Material to produce concrete“. 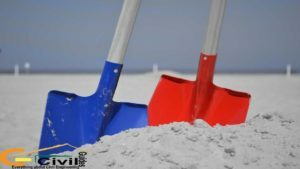 These act as fillers or volume increasing components on the one hand and are responsible for the strength, hardness, and durability of the concrete on the other hand. I hope that Aggregate Definition will be cleared. Following are the most important qualities of an Aggregate. 1. It should be chemically inert, i.e., they should not react with cement or any other aggregate or admixture. 2. It should possess sufficient hardness to resist scratching and abrasion in the hardened state. 3. It should possess sufficient toughness to bear impact and vibratory loads. 4. It should be strong enough to bear compressive and normal tensile loads in the ordinary mixture. 5. It should be free from impurities, inorganic or organic in nature, which will affect adversely on its quality. 6. It should be capable of producing an easily workable plastic mixture on combining with cement and water. This is the most common classification, where in two types of aggregates are distinguished: (Fine and Coarse). In the Fine Aggregates, the grain-size lies between 4.75 mm and 0.15 mm. In other words, these pass-through from sieve with the mesh size of 4.75 mm and are retained on a sieve of 0.15 mesh size. Sand is the most universally available natural Fine Aggregate. Coarse aggregates are those that are retained on the sieve of mesh size 4.75 mm. Their upper size is generally around 7.5 mm. 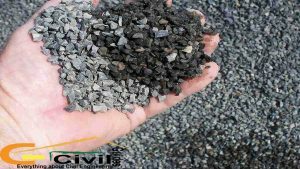 Gravels from river bed are the best coarse aggregates in the making of Common Concrete. In those situations, if they are not easily available, Suitable rock types are crushed to the desired particle sizes for making coarse aggregates. There are three types on the Basis of Origin. These include all those types of fine and coarse aggregates, that are available in almost ready to use form, from natural resources. Examples are sands from river beds, pits and beaches, and gravels from river banks. These include materials obtained as wastes from some industrial and metallurgical engineering operations, which possess suitable properties for being used as aggregate. Examples: Cinder obtained from burning of coal in locomotives and kilns. And Slag is obtained from blast furnaces as Scum is the best example from this category. These form a special class in Aggregate. They are specifically manufactured for use in making Quality Concretes. Examples: They include burnt clay, Shales, vermiculite’s and perlite. They are essential Ingredients of Lightweight Concrete. Three types of aggregates are distinguished on the basis of their weight per unit volume. These types of aggregates give strength and weighting to the Concrete of around 2300 to 2500 kg/m3. Gravels, Sand and Crushed stone, are all classed as Standard or Normal Aggregates. These are that type of Aggregates, which is used in standard proportions yield in heavy weight concretes. Such concretes are especially useful as shields against X-rays and radiations in the atomic power plant. Examples: Baryle – a natural mineral with a specific gravity of 4.3 is an example. Concretes with such aggregate usually weight above 4000 kg/m3. They consist of natural and artificial materials of very low density so that the resulting concrete is also quite Light in weight, generally with in a range of 350 to 750 kg/m3. They are specially used in sound proofing and fire proofing constructions. They are also used extensively in the manufacture of light weight Pre-Cast concrete blocks. I am looking for the types of coarse aggregates? ?